I haven’t posted a recommended resource list for a while, but hopefully today’s group of piano related publications and courses will be of interest. As always, there’s plenty for piano aficionados of all levels and abilities, from collections and compilations to new concert studies for the virtuoso pianist, and several inspiring piano courses set in sumptuous scenery. Competition giveaways of some of those resources mentioned here will be coming soon. Enjoy! This is a two-book piano course published by Schott Music and written by me. Book 1 will be available from April 3rd 2017 (Book 2 is scheduled to be published in June). 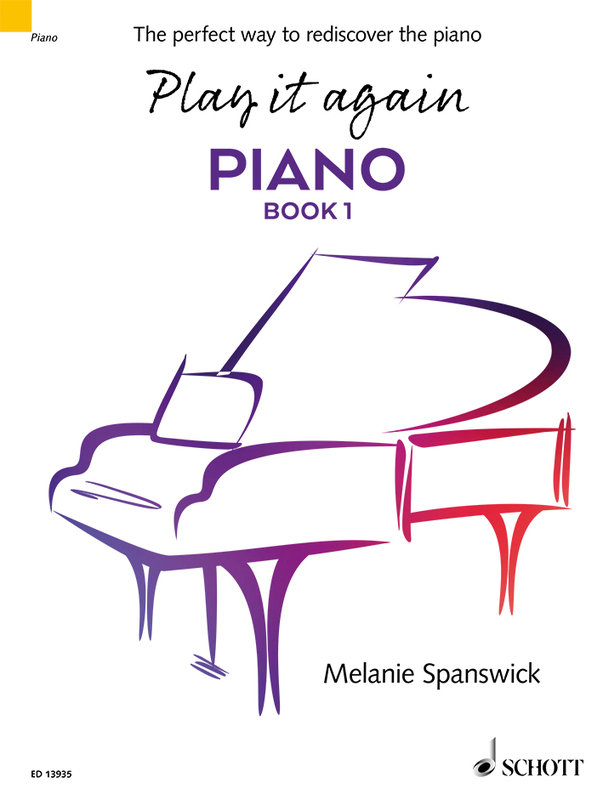 Designed for those returning to piano playing after a break, the course would also be useful for any teenage or adult piano student requiring a selection of progressive piano pieces to either study alone or whilst working with a teacher. Book 1 features twenty-eight selected pieces from approximately grades 1 – 5 standard. 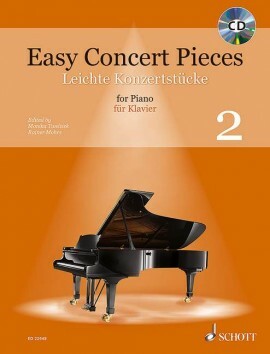 Each section contains seven piano pieces, and they are categorised as Elementary (grades 1 – 2 level), Late Elementary (grades 2 – 3), Early Intermediate (grades 3 – 4), and Intermediate (grades 4 – 5). I have included a huge array of genres from Baroque music through to rock, jazz and improvisation; each level includes an arrangement and a technical study. Every piece has two pages of practice tips and suggestions, with photos, diagrams and musical examples. You can find out more and watch taster videos here, and purchase your copy here. 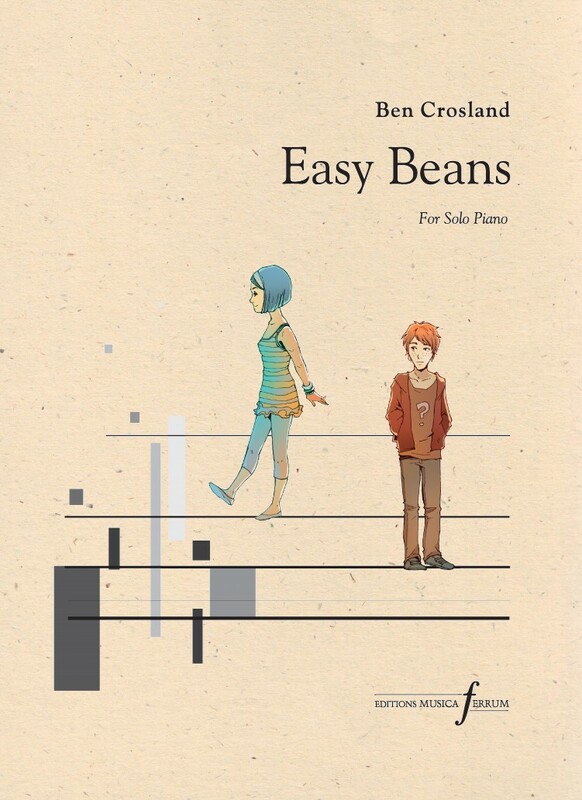 Two volumes for late elementary students written by Spanish composer Juan Cabeza and published by Piano Safari. 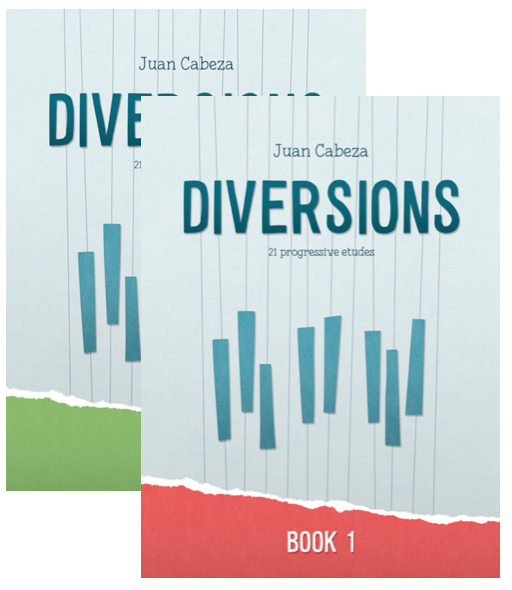 Diversions Book 1 and Book 2 contain a collection of 42 patterned etudes for piano. Each etude focuses on a single technical pattern encountered by students in the early stages of piano study, including scales, arpeggios, chords, repeated notes, intervals, and other common pianistic patterns. The patterned structures make it easy for students to decode and understand the music. Most of the pieces are transposable allowing students to assimilate each concept thoroughly. These works range in difficulty from elementary to early intermediate level. I really like Juan’s music and I know young players (and teachers) will enjoy using these pieces in both lessons and concerts. Find out more and purchase here. A collection of concert pieces in progressive order from fairly elementary to intermediate level. According to publishers, Schott Music, ‘These pieces are intended to complement a piano tutorial method and are particularly suitable for performance at auditions, concerts, competitions and examinations.’ They offer totally varied repertoire in a broad selection of pieces from the Baroque, Classical, Romantic and Modern periods. It’s always useful to have compilations such as this, whether you’re a teacher or student, and this volume would make ideal sight-reading material too. The publication includes works by; Petzold, Dandrieu, Handel, J.S Bach, Haydn, Vanhall, W. A. Mozart, Beethoven and many more. Purchase your copy here. 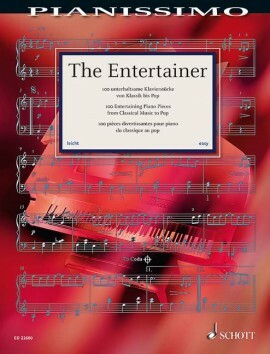 A new volume in the Pianissimo collection published by Schott Music; 100 entertaining pieces are suitable for intermediate players, and contain much-loved favourites such as The Entertainer, the soundtrack from Amélie, My Heart Will Go On from Titanic, Memories from Cats, My Way by Frank Sinatra, amongst others. ‘Classical Highlights’ feature Mozart’s Turkish March, Wagner’s famous Bridal Chorus, Brahms’ Hungarian Dance No. 5. ‘Song Highlights’ contain catchy tunes from the areas of blues, gospel, and folk music, like Oh Happy Day, Down By The Riverside or Matilda. A mixture of original pieces and arrangements, there’s definitely something for everyone here! Buy your copy and find out more by clicking here. Film Themes: The Piano Collection, published by Faber Music, contains thirty sympathetically arranged classic yet contemporary, and ‘up to the minute’ pieces for the intermediate to advanced player. Featuring favourites from such films as Star Wars, Frozen, Hunger Games, How To Train Your Dragon and Twilight, plus several pieces from the Harry Potter film series and “Mia and Sebastian’s Theme” from the acclaimed new movie La La Land. This selection offers an excellent alternative to standard repertoire, particularly for the film buff, and I know my advanced students would love this volume as a fun alternative to traditional sight-reading material. 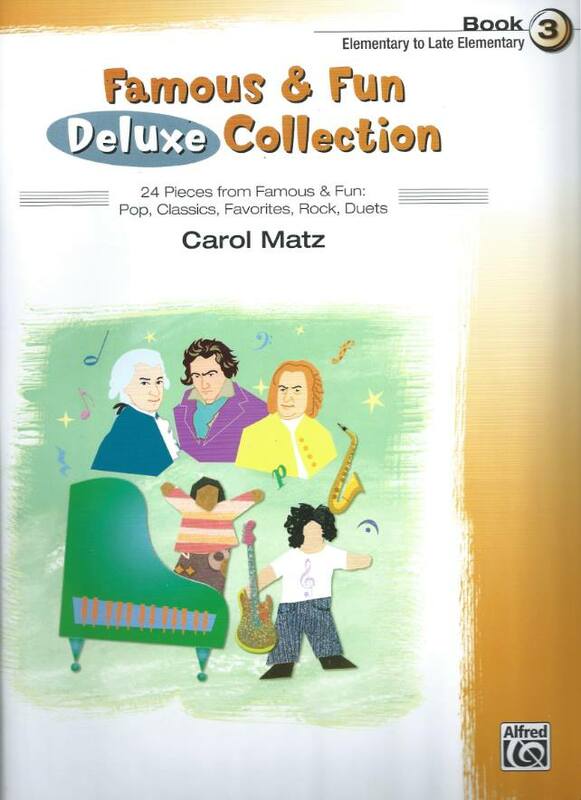 A great addition to the student, teacher and piano lover’s library. Purchase your copy here. Not necessarily a new publication, but one which must be included on this list. 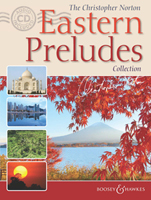 Eastern Preludes (published by Boosey & Hawkes) are a collection of intermediate to advanced level pieces written by the outstanding educational British composer, Christopher Norton. No doubt inspired by the composer’s many visits to the East, they are sure to be favourites amongst those who seek alternative repertoire between exams or different concert repertoire material. Each one explores the rich musical landscape of the East weaving native themes from countries including China, India, Japan, Korea, and Thailand with the composer’s characteristically attractive, popular style. A useful accompanying CD features each work, and has been beautifully recorded by pianist Iain Farrington. I enjoyed exploring these pieces; they are comfortable to play and perfect for those who like to delve into various atmospheric sound worlds. Find out more and buy your copy here. The music from the new hit movie. 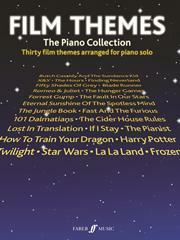 Those who loved the film will surely appreciate this piano assortment of ten numbers, published by Faber Music. The romantic musical comedy-drama film has now won six Oscars, seven Golden Globes and six BAFTAs. 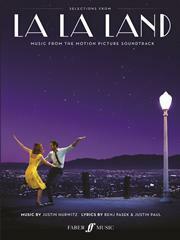 Written by Justin Hurwitz, Benj Pasek and Justin Paul, this excellent selection have all been transcribed for piano and voice with guitar chords, following the original music and keys as closely as possible. I would suggest the arrangements are generally for advanced pianists, but some are simpler, and may be suitable for those of intermediate (roughly grades 4 – 6) level. You can purchase your copy and find out more here. A new set of advanced concert studies (Grade 8 – diploma) by British writer and composer Andrew Higgins. Published by EVC Music Publications, each piece focuses on a different bird; Penguins (a study in bi-tonality and chromatics), is described by the composer as ‘a polytonal life of joie de vivre and exuberance on the one hand, and clownish clumsiness on the other’. This is followed by A Wise Old Owl (a study in control and tempo), The Swan (a study for three against twos), Albatross (a study in three-part playing), Hummingbirds (a study in flexible rhythms and rubato), and Lovebirds (a study in improvisation). All good fun and very useful for technical development. You can listen to each piece, purchase your copy and find out more here. This new anthology (published by Boosey & Hawkes) explores the late works and life of the Argentinian composer. 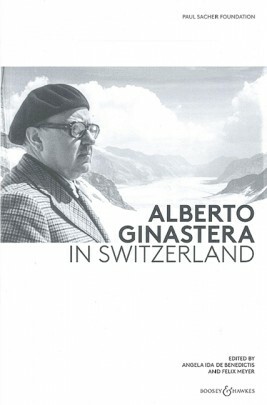 In 1971, Alberto Ginastera (1916–1983) relocated to Geneva to make a fresh start with Aurora Natola, an Argentinian cellist resident in Switzerland. This volume was published on the occasion of the first centenary of the composer’s birth, and the Paul Sacher Foundation seeks to retrace the previously little-known late phase of Ginastera’s life and works. 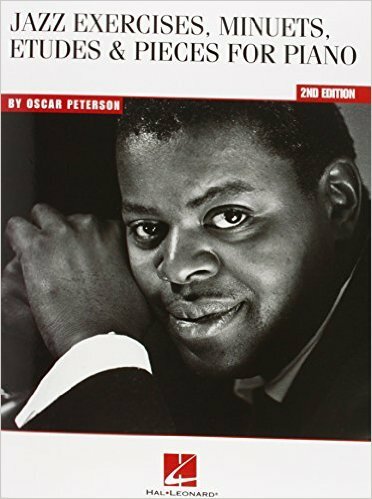 Featuring six essays illuminating different facets of his late years on the basis of the surviving manuscripts, letters, and other records, this publication is a fascinating historical document and selection of piano pieces. Find out more and purchase here. 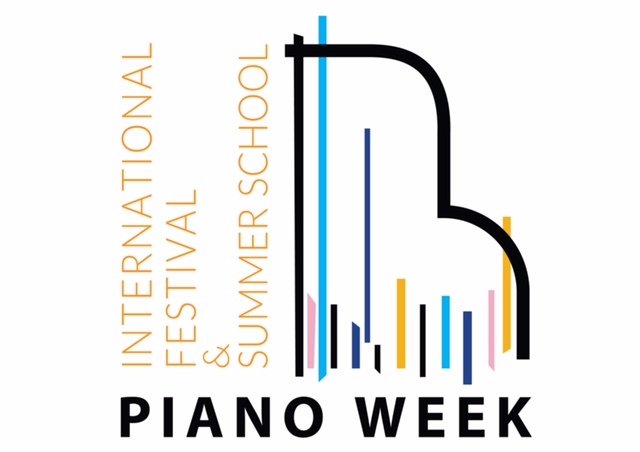 Organised by British concert pianist Samantha Ward, this non-residential full-time piano course and festival is set in spectacular Italian surroundings. It’s one of a whole series run in various parts of the world throughout the year, offering students lessons, performance opportunities, sight-reading classes, composition and music theory classes, plus time to practice and the opportunity to attend all faculty recitals and master classes. The upcoming course takes place in beautiful Foligno, and there are still a few places available. The faculty includes Samantha Ward, Maciej Raginia, Roberto Russo, and Mark Nixon. Running from 20th – 23rd April 2017, you can apply to attend or participate, and enjoy the new promotional video here. My recommended resources have finally appeared on the last day of this month (my Birthday! ), and I hope there are some useful and interesting selections of piano music, books, online resources, and piano courses. British composer Ben Crosland has written many piano pieces for young players, and his compositions have been included in the Trinity College of Music Examination syllabus (including the current 2015/7 syllabus). His latest offering, Easy Beans! contains 32 Progressive Studies in Popular Styles. 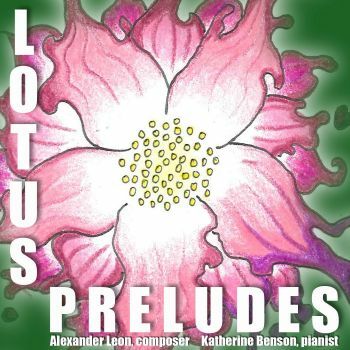 Published by Editions Musica Ferrum, the pieces are around Grades 2-5 standard (ABRSM and TCL level), consisting of completely contrasting styles. This will be helpful and interesting to both students and teachers, who not only like variety but will also appreciate the progressive nature, encouraging pupils to tackle increasingly complicated repertoire. 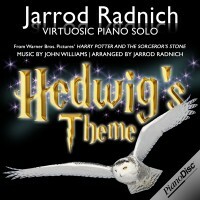 You can listen to a selection of works here and purchase the score here. 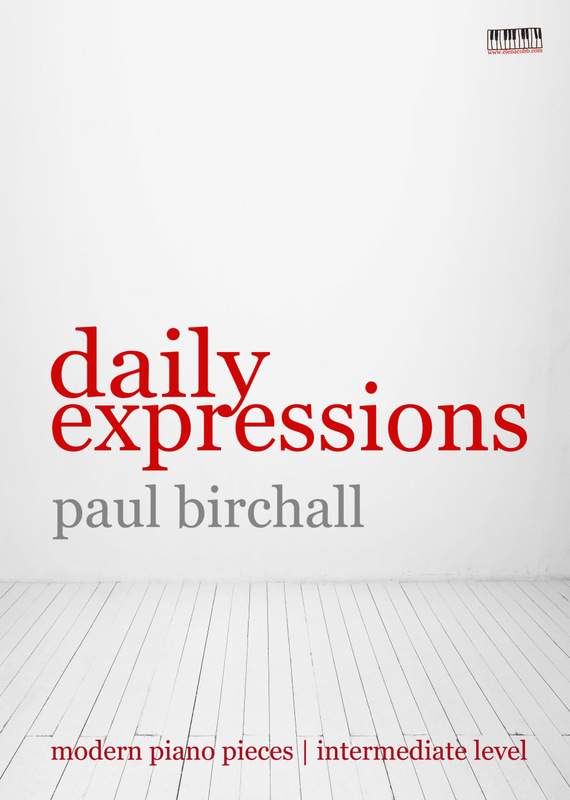 My own piano pieces were published earlier this month, and it has been an exciting project. 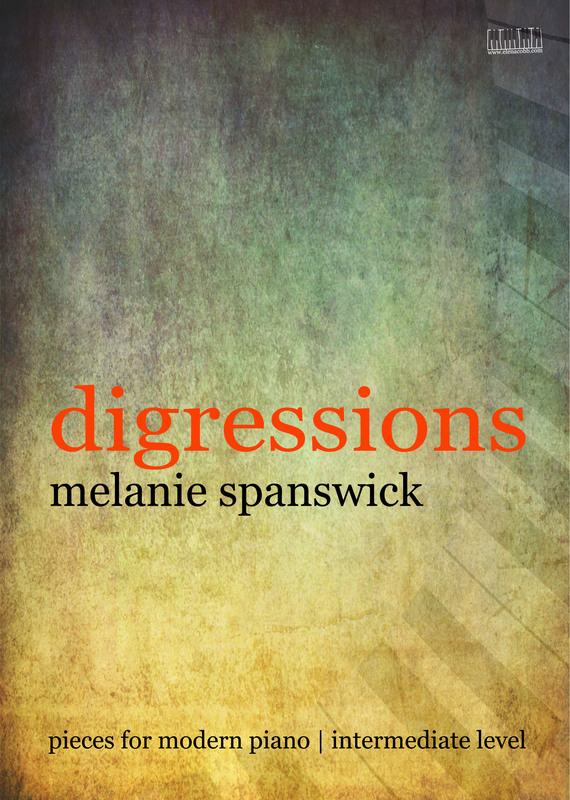 Entitled Digressions – 5 Pieces for Piano, and published by EVC Publications, the pieces are approximately Grades 4 – 6/7 standard. My aim is to provide an alternative to the ‘jazzy’, pop, easy listening or musical theatre genres which regularly appear for less experienced players. Mature amateur pianists sometimes feel less comfortable playing these styles, so my pieces are intentionally Minimalist, tuneful and meditative. They fall easily under the hands and can be played individually or as a set. You can listen to each piece here and purchase them here. A great collection for those wanting to explore lighter repertoire. Written by John Kember and published by Schott Music, the volume includes 18 pieces of around Grades 5/6 standard. Nine pieces are in a ‘rock’ style , whilst a further nine, in a ‘rock ballad and soul’ style. Bright, lively tunes, many with a strong rhythmic pulse plus copious syncopation, provide lots of opportunity to relish piano sonority. Chord symbols are also written in the score. Purchase here. Written by British composer Jenni Pinnock, whose works are heavily influenced by nature and the natural world, Rains is a beautiful contemplative piece for those of approximately Grade 6 standard. Composed in August last year, and lasting around three minutes, it was inspired by summer rain falls. A gentle, meditative flow forms the anchor of the piece, over which a singing melody floats. As torrential rain ensues, the music increases in volume, texture, power and difficulty before the gentle flow of rain returns, slows and finally stops. You can hear and purchase this piece here. This online resource was devised by Australian teacher Tim Topham, who runs a popular blog and who specialises in teaching pop music, particularly for piano teachers. 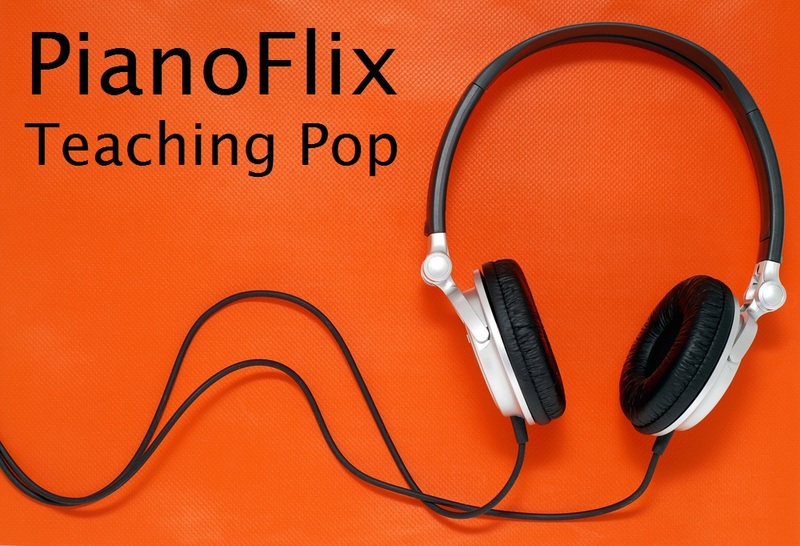 PianoFlix is a series of eight videos; Tim takes prospective pop players and teachers through various methods, via different tools. The first two videos are free and full of helpful advice. Many find teaching pop styles challenging, and this resource provides masses of information, practice techniques and ideas, and repertoire suggestions. For much more information click here. Australian piano teacher Jackie Sharp has written this extremely beneficial and detailed guide enabling piano students to develop a perfect technique. Technique Trainer 1 is the first in a three-part series of technical and musical exercises, presented systematically in order to hone ‘the foundations of a competent technique’. This book contains copious drawings relating to hand positions and posture (which are effective and easy to comprehend). Piano playing ‘Dos and Don’ts’, wrist movement, and forearm rotation are carefully explained with many musical exercises and bonus learning activities for the student to assimilate. There are also links to video presentations. You can purchase the e-book here. 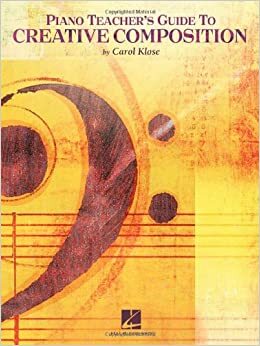 Written by Carol Klose, this guide cleverly breaks down compositional techniques, allowing teachers to deliver them in bite size chunks in lessons, devoting just a few minutes of lesson time to composition. The book is essentially structured in five sections; preparing the foundations, exploring compositional components, outlining a composition, how to plan a lesson, and putting finishing touches to a work. 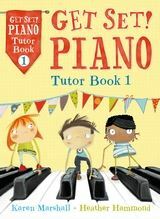 With a book such as this, teaching composition to piano students won’t seem so daunting. Purchase the book here. 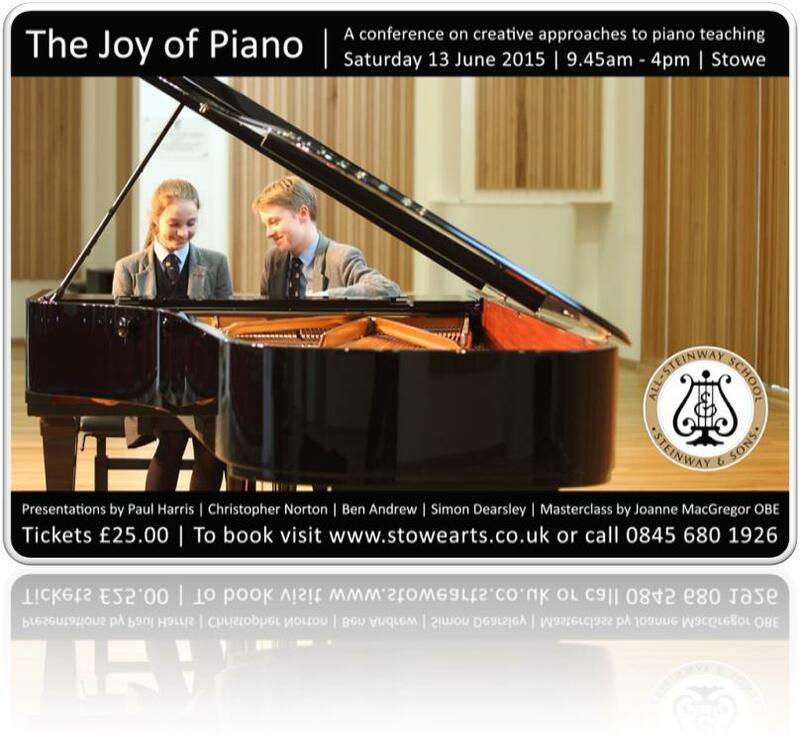 The Joy of Piano conference is ideal for pianists and piano teachers who would like to enhance their teaching skills and discover new and exciting ways to inspire and motivate their students. An excellent opportunity to meet fellow piano teachers as well as observe presentations and master-classes. Guests include Joanna MacGregor OBE, Paul Harris and Christopher Norton. There will also be presentations given by Ben Andrew, Head of Keyboard at Stowe and Simon Dearsley, Director of Music. The conference will take place in the Chung Music School at Stowe School, Buckingham on June 13th, and you can find out lots more here. 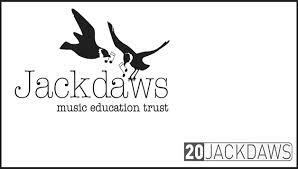 Jackdaws is a music education trust providing short residential courses in the tranquillity of the English Somerset Countryside. Expert instrumental and vocal teachers offer their advice and tips to small groups over the period of a couple of days. This course, featuring pianists Julian Jacobson and Mariko Brown, focusses on playing duets, and will be held from 3rd – 5th July 2015. Players are invited to attend as a pre-formed duo or solo (where they will be teamed with another like-minded soul!). This will no doubt be a fun and inspiring event and you can book here. 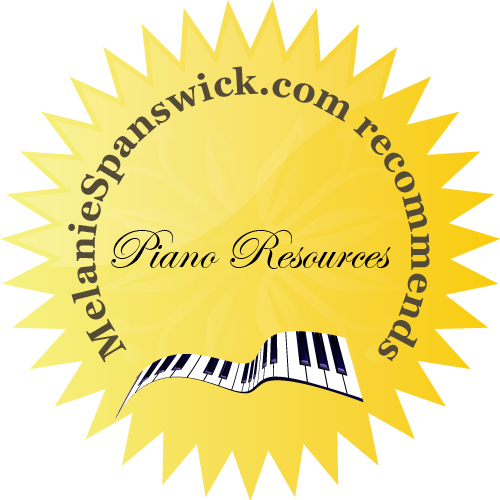 I’m delighted you enjoyed reading my recent post, recommending 15 top piano resources; many books, sheet music and downloads were purchased as a result, which is exciting. So here are a few more ideas for piano fans everywhere. You’ll notice I now have a smart new ‘recommendations badge’, so I’m hoping to make this a regular blog feature. We all need new, or simply different, music and fresh ideas when teaching, playing the piano or seeking helpful online resources, so whether you are a beginner, a more advanced player, or a piano teacher, I hope there will be something here for everyone. 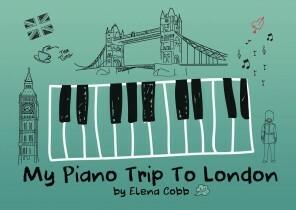 Also included this month; an interesting online piano show, plus information on various piano memberships. 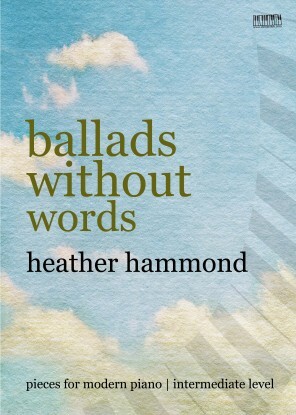 This series of piano tutor books is published by Bloomsbury and written by British composers Heather Hammond and Karen Marshall. Well laid out and easy to follow, there are several volumes in the series (once Book 2 has been studied, students are apparently approximately Grade 1 standard). The first book in this progressive series guides beginners from their very first lesson through to Prep test level. Note learning is taught alongside aural, theory and composing skills providing a holistic approach to music. There is a handy ‘Tutor’ book and ‘Pieces’ book which together provide ample material for beginners. Get your copy here. 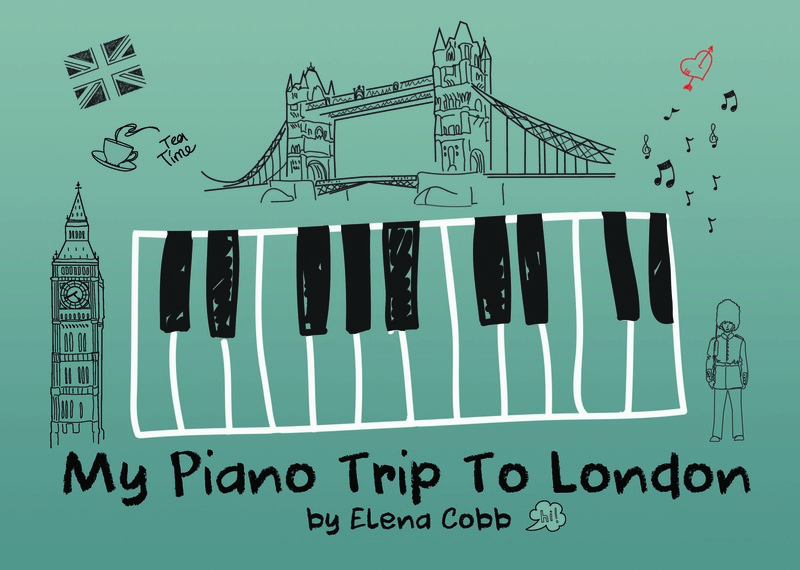 Composed by British pianist Mark Tanner, there are 11 books in this series, which takes students from pre-Grade 1 up to Grade 8, and some of the pieces have been included in the London College of Music exam syllabus. 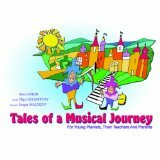 Tuneful, easily accessible and very ‘now’, with references to computers, the iPad (in some of the later volumes), and humorous descriptive titles, such as Music to Milk Cows by and The Worm has Turned, which youngsters will love. This volume will capture the young player’s imagination, and uses white notes only, so would serve as the perfect ‘My first recital’ book. Published by Spartan Press, get your copy here. Written by Australian composer Carl Vine, this beautiful piece was written in 1994 and is the final work in a collection entitled Five Bagatelles. It is sub titled ‘for all the innocent victims’ and was composed for the Australian National AIDS Trust. 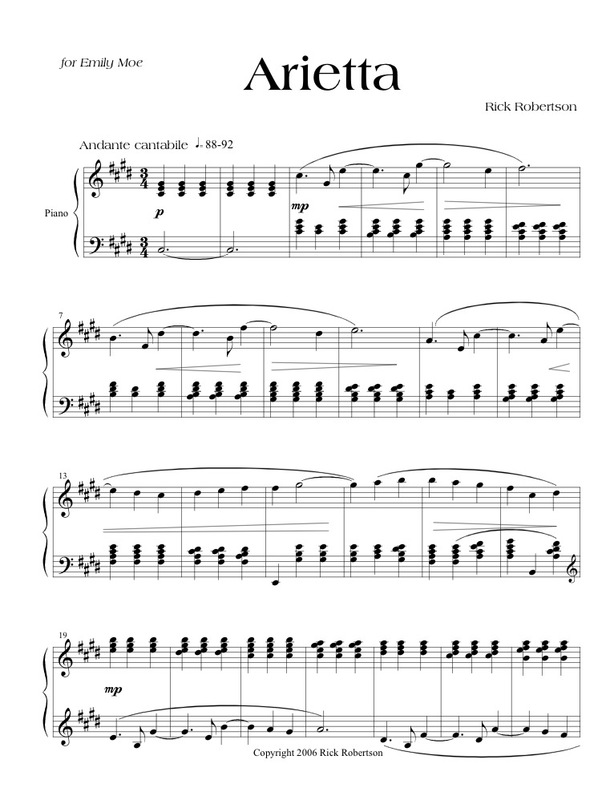 Threnody is the simplest piece of this set (other pieces are around Grade 7/8), but this would be an ideal Contemporary work for pianists of Grades 5/6 standard (it’s one of the ABRSM selected works for Grade 6 2015/6). It requires the performer to read three staves at once (great practice), would suit those with a wistful imagination, and also provide a great backdrop for pianists wanting to develop an expressive, varied tonal palate. Use of pedal is crucial too. The overall impact is one of atmospheric beauty and emotion. Get the score here. 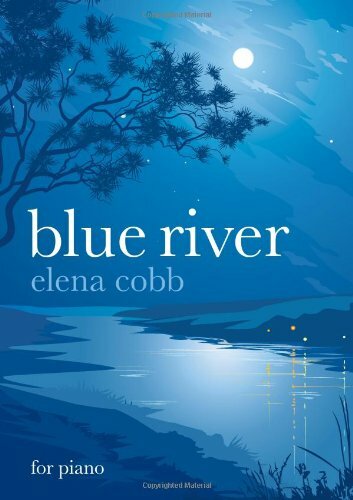 A funky collection of bright, upbeat, jazzy pieces written by British composer Elena Cobb. Written out Jazz, but with plenty of references to Blues and Latin style, these pieces would benefit from great rhythmic energy and a ‘swung’ feel. Titles such as Star Dust, Tango Leone and Cloud Seven, Latin, will no doubt inspire pupils, who will also enjoy the tuneful, cheerful approach. Around Grade 5/6 level, the volume consists of six pieces; listen and get your copy here. Piano Notes are published by Rhinegold Music and produced in conjunction with the Music Teacher Magazine and International Piano Magazine. 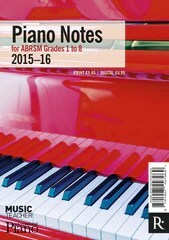 It’s essentially a guide to assist piano teachers whilst they prepare students for the ABRSM (Associated Board of the Royal Schools of Music) piano exams; this recently published volume features Grades 1 to 8 of the new 2015/16 syllabus. 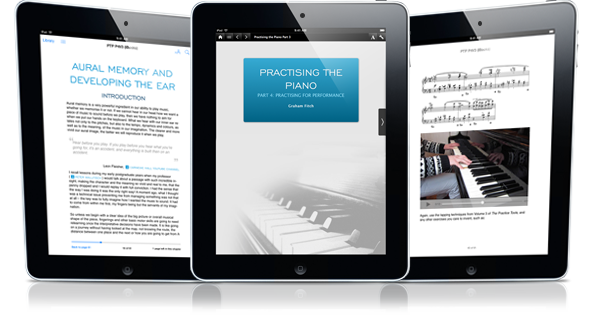 It contains information on every piano piece for each grade, including all those on the alternative lists, and there are plenty of useful practice ideas on offer. Piano Notes have been written by a whole team of piano writers; Murray McLachlan, Michael Round, Katharine May, Fiona Lau and myself. 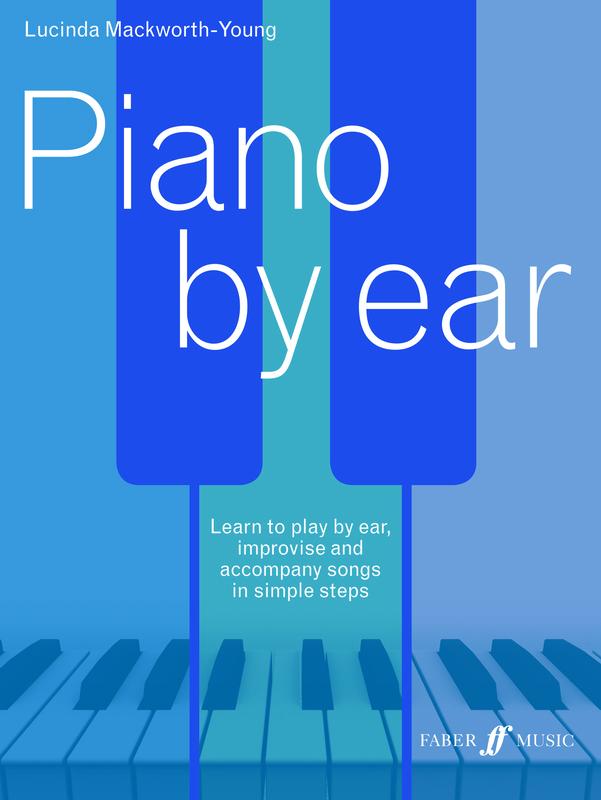 Although not strictly a piano resource, this is an excellent concept, and music theory is a crucial part of learning to play (in my opinion). Sproutbeat is based in the US, and offers worksheets which are immediately downloadable on your iPad. There are more than 400 theory worksheets and games to download on Sproutbeat, with more added very week. You can try a free demo on the website and the Apps are available from the App Store. You can try up to 25 worksheets for free, and can find out lots more here. Yes, there is even an App for those who like Hanon exercises! HanonPlus is not for everyone of course, but for those who enjoy practising studies and working at technique, this may be a useful App. It comes with 20 built-in exercises from Hanon Book 1 which students can practice in any major or minor key. Each one is listed by the fingers it aims to strengthen. It’s fully interactive and customizable, and suitable for beginners through to more advanced players. Be sure to practice with care, as studies such as Hanon can induce tension issues if practised incorrectly. Click here for more information. A unique ‘hybrid’ experience, American musician and teacher Leila Viss has created a one stop shop for piano teachers everywhere. 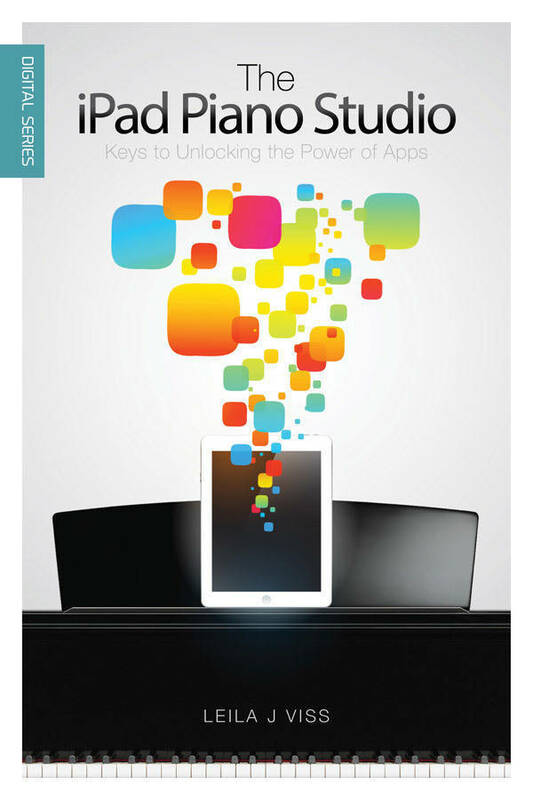 Those new to using the iPad in their lessons will benefit from instructions and copious ideas about how to incorporate technology into piano lessons. Leila has combined print and digital editions with a website and blog, fostering a completely interactive concept, and her love and enthusiasm for the iPad is infectious. A new kind of classical music show held at PianoForte Studios in Chicago. This live show will be simultaneously broadcast online. Russian-born pianist Yana Reznik, leads intimate discussions with the world’s renowned artists about their experiences on stage and behind the scenes. 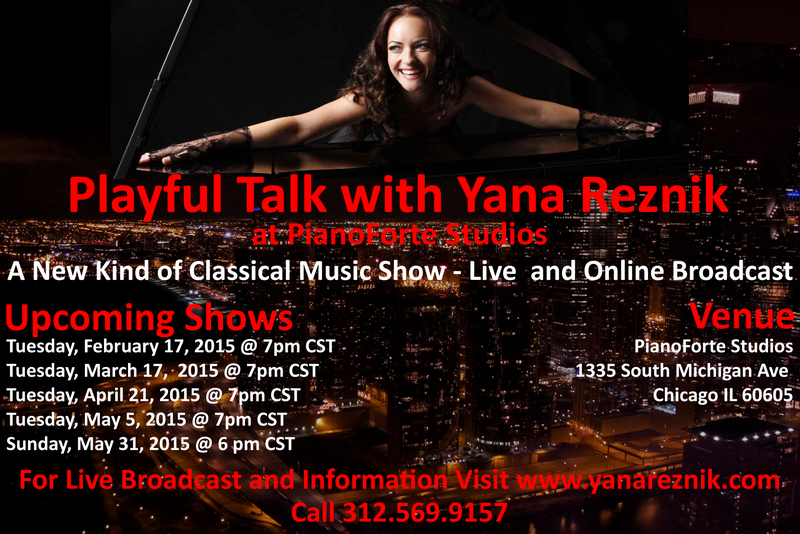 Guests then join Yana in music making, either prepared classical works or improvisations. For the first time, both live and internet audiences will really get to know the men and women behind the music in a fun, spontaneous way. Audience members are encouraged to ask questions via Twitter (@playfultalk), which will be answered selectively after the performances. The first show will be broadcast on Tuesday February 17th at 7pm CST. This popular Society is about to be completely revamped under the tutelage of pianist and composer Julian Jacobson, who has just been appointed Chairman. Julian is introducing a new concert series and other initiatives, including a chamber music project. At present, the Society runs three annual competitions, but there are plans to develop links with Beethoven organisations around the world, linking with various conservatoires and festivals. Membership is only £20 annually for full members, £25 joint (two people at same address), £25 outside Europe. Student membership is only £7! There is also a special rate of £15 for EPTA and ISM members, and a Single Life Membership rate of £150. The European Piano Teachers Association, UK was founded in 1978 by Carola Grindea, who also founded a Europe-wide coordinating body, EPTA. EPTA now has Associations in almost every European country, and an International Conference of all EPTA Associations is held in a different country each year. 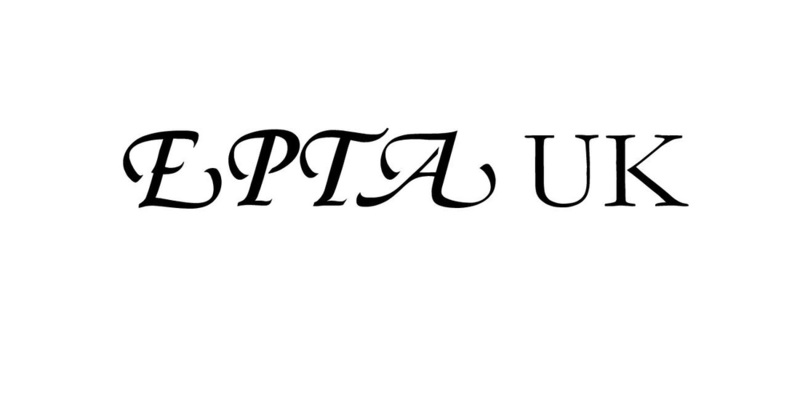 The aims of EPTA UK are to promote excellence in piano teaching and performance, to bring teachers and performers together and to raise standards within the profession. This superb organisation offers many benefits for members, including publications, copious events, conferences and courses.